"As Jesus has chosen bread, which is very common, so must my life be, common ... approachable by all and, at the same time, humble and hidden, like bread". These words of Eugenia Picco flow from long contemplation of Jesus, Bread of life, broken for all. Eugenia arrived at this synthesis after a long and painful journey. Anna Eugenia Picco was born in the little town of Crescenzago, in the district of Milan, on 8 November 1867, the daughter of the famous musician, Giuseppe Picco, and of Adelaide Del Corno. Eugenia was raised mainly by her grandparents and saw her parents only for brief intervals between tours, until one day when her mother returned alone, without her husband, giving Eugenia to believe him to be dead. After the mysterious disappearance of her father, she remained with her mother and grew up in an irreligious and morally corrupt environment. "Dangers and occasions at home and outside", Eugenia said when recalling those troubled years and that "instinctive" strength to pray, to raise her gaze on high, in the silence of the austere Basilica of St Ambrose where each day she would go to pray to God, almost without knowing him. One evening in May 1886, Eugenia felt a call to sanctity and from that moment on she aimed at perfection with a faithful readiness without turning back. Thus at the age of 20, Eugenia decided to seek Jesus and to be holy. Providentially, the founder of the Congregation of the Little Daughters of the Sacred Hearts of Jesus and Mary was already in Milan. He was tied by a long time friendship to the Ursuline Sisters in Milan, to whom Eugenia had confided her desire to become a religious sister. One of these sisters asked Don Chieppi to receive Eugenia into his congregation. In 1887, Eugenia ran away from home and was immediately accepted, understood and loved by the founder of the congregation, the Venerable Servant of God Agostino Chieppi. On 26 August 1888 she began her novitiate in Parma, Italy; on 10 June 1891 she made her first profession in the hands of the founder and, in 1894, she made her solemn profession. After her profession, she accepted some important offices, such as novice mistress, archivist, general secretary and member of the council. As Superior General, from 1911 until her death, she showed excellent governing skills and joyfully undertook to fulfil her duties as well as tasks in the social field, mainly during the First World War. She was a courageous woman and greatly enriched the spiritual and cultural formation of the sisters, always faithful to her life programme which was "Suffer, be silent, love". She joyfully accomplished her duties as Superior General with serene and tranquil perfection, in order to carry out God's will. She was a mother to all especially to the poorest, the little ones, the lowly ones whom she served with generous and tireless charity. The needs and tragedies of her brothers created by World War I, 1915-1918, opened her heart even more to receive every cry, pain and social or individual concern. The Eucharist was Eugenia's main support, the vital fulcrum of her interior life and of all her work and apostolic activity; it was her great love, the centre of her piety, the food, comfort and joy of her days filled with prayer and fatigue. Christ instilled in her his zeal for the salvation of souls, his burning desire to lead all to the House of the Father. 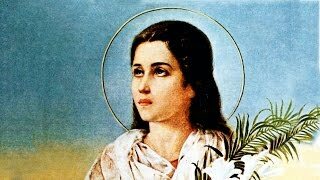 It was her constant love for Christ, burning within her, that explains her constant charitable activity. Of weak health, due to a degenerative bone condition, which in 1919 led to the amputation of her right lower limb, she offered herself, willingly, for the accomplishment of God's plan, ready for every immolation, remaining always a smiling friend of Christ, her brethren and the world. This dynamism which concentrated all of her desires, all of her will on God, this firm resolution to tend to perfection expressed by a life of mortification, purity, obedience, heroism of virtuous works, living the most humble ordinary things in an extraordinary way, was the climate of Sr Eugenia Picco's life. On 7 September 1921, she died in the odour of sanctity. Sr Eugenia was seen by all as an example of extraordinary virtue and as a model of piety, prudence, zeal and spirit of sacrifice, as well as a wise teacher.